Apple Dippers, an alternative to french fries in Happy Meals, will use some 20 million pounds of apples per year. As the foodservice sector adds more “healthful” offerings, it also adds potentially unhealthy items. Meeting current consumer interest in healthful fare often means fresh produce, minimally processed foods and rare or even raw meats – all of which demand special handling. But food safety always has been foremost in the minds of the foodservice industry. Now, along with the foodservice sector’s increased vigilance come some new technologies for processors to keep these fragile foods safe. When McDonald’s decided to add a fruit item, the restaurant chain was prepared for the impact that menu addition would have. Apple Dippers, an alternative to french fries in Happy Meals, will use some 20 million pounds of apples per year, says William Whitman, a McDonald’s marketing director. Add another 35 million pounds for the firm’s new apple and walnut salad, and McDonald’s has 55 million reasons to be concerned about apple handling and processing. The apples are scrubbed, peeled, sliced and given a quick bath in calcium citrate to adjust the acid levels and keep the flesh white, according to Sarah Schlukebir, vice president of sales and marketing for Peterson Farms Fresh Inc., a Shelby, Mich., apple processor and packer for McDonald’s Dippers. Then they are popped into modified atmosphere packaging, The apples are never allowed to exceed 35°F, during the process or during holding. The McDonald’s folks didn’t want to talk about food safety, but their awareness that a case of foodborne illness could devastate the market is present. Privately, they comment that they haven’t just been lucky, they’ve been very careful. Despite improvements in understanding of foodborne disease and the reduction of incidence per thousand of population, the increase in total population keeps the numbers high. During 1999, the most recent for which figures were available, the Centers for Disease Control identified 10,697 laboratory-confirmed cases of nine diseases under surveillance: 4,533 of salmonellosis, 3,794 of campylobacteriosis, 1,031 of shigellosis, 530 of E. coli O157:H7 infections, 474 of cryptosporidiosis, 163 of yersiniosis, 113 of listeriosis, 45 of Vibrio infections and 14 of cyclosporiasis. 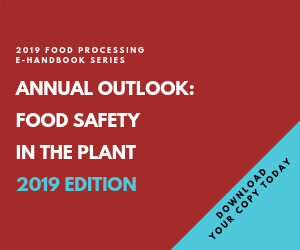 The per-capita decrease in foodborne illness corresponds roughly with disease prevention efforts, including changes in meat and poultry processing plants, new requirements for foodservice establishments and increased attention to good agricultural practices for produce and eggs on farms. While traditional types of foodborne illness decreased, some lesser-known ones appeared. In 1999, several large salmonellosis outbreaks were traced to produce, including unpasteurized orange juice, mangos and raw sprouts. A decline in Shigella followed an outbreak in 1998 traced to imported parsley, which increased attention to produce-associated shigellosis. A new threat arrived in early June, when Robert Brackett, director of FDA’s Center for Food Safety and Applied Nutrition, announced the agency was “aggressively working with federal and state partners” to determine the source of fresh basil thought to have caused several cases of cyclosporiaosis in Florida. Consumers and foodservice employees were reminded of the necessity to wash vegetables and herbs, especially leafy ones, thoroughly. In the meantime, a lot of research at the university level is busy finding the best treatment for individual produce crops. Produce suppliers can shop through the various technologies and choose (and possibly license) the one that fits best. While fresh fruits and vegetables are a current concern of CDC and FDA, eggs and salmonella have been high on the radar for a number of years. Industry has chosen two ways of combating the problem: pasteurized egg mixes and precooked egg products such as egg patties. Both go a long way toward eliminating the possibility of microbial contamination. It’s important to remember that even a safe egg, bag of produce, oyster or other ingredient or product must be treated like the sensitive ingredient that it is. Products that are pasteurized can be recontaminated. While these safe ingredients help avoid foodborne illness, constant vigilance is required to prevent recontamination on a processing line, in the kitchen or in packaging lines. It’s important not to get careless, despite the extra margin of safety that these special products provide. A newer development that has been moving toward national distribution is pasteurized in-shell eggs. They offer safety from Salmonella organisms even when prepared sunny-side-up or used in Caesar dressing. National Pasteurized Eggs (www.safeegg.com), Lansing, Ill., operates under patents issued to James and Duffy Cox in the mid-1990s with additional patents issued later. The firm first developed the process, then financed the building of machines that could be FDA approved. The original FDA approval came in 1995, but it was the early part of 2002 before the shell egg with the approval rating made it to a broad market. Most of the company’s product is sold to foodservice organizations; a major customer is Sysco Systems. Another major user is importers from Hong Kong, who supply the safe eggs for Hong Kong’s favorite dish: raw egg over rice. According to President Gregory West, the pasteurization process kills all strains of Salmonella including Salmonella enteritidis bacteria, which according to the FDA is found in one out of every 20,000 eggs and causes a reported 1.4 million illnesses per year in the U.S. This process is extremely cost-effective and delivers total product consistency, meeting all FDA standards. The eggs vary in price according to size, but generally they cost 3-5 cents more each. National Pasteurized Eggs’ unique technology is the only one capable of pasteurizing large quantities and all sizes of shell eggs to exacting FDA requirements, West says. Egg consumption is making a comeback. Plus, the demographics of heavier egg-eaters make such a safe product especially important. “Older customers eat 61 percent of the eggs served for breakfast.” Salmonella is especially dangerous to the older population, the very young and those who are ill or otherwise immune-compromised. “The pasteurized egg is especially good for older eaters: the liquid yolk in a sunny-side up egg, when eaten with toast, is something they are accustomed to and it reminds them of childhood,” adds West. The “raw” safe egg also is handy in Caesar salad, tiramisu and in Eggs Benedict and other forms of poached eggs. New concern for flock safety also has reduced the bacterial burden. National Pasteurized Eggs has contracts with specific farmers for certain flocks of birds, and identifies feed sources (no animal by-products, vegetarian feed) so the eggs are Kosher (circle U on the package). Of course it’s timely that the egg has been restored to its position as king of the breakfast menu. The small amount of fat and high amounts of folic acid and other nutrients have brought eggs back to the mainstream. Oysters are another product many restaurants stopped using a few years ago because of food safety concerns, but new techniques and careful quality control are leading to a resurgence. AmeriPure Oyster Co. (www.ameripure.com), Franklin, La., produces oysters that are cold pasteurized, according to spokesperson Billy Thompson. Vibrio can flourish at extremely high levels in warmer waters, such as the Gulf of Mexico. Vibrio vulnificus is potentially fatal to persons with weakened immune systems and Vibrio parahaemolyticus can cause gastrointestinal illness in perfectly healthy consumers who eat shellfish with sufficient levels of the bacterium. The AmeriPure Process was invented as a product-specific solution to the problems of increased regulation and eroding public confidence in Gulf Coast oysters. Louisiana State University's Food Science Dept. furthered the research. The process is so effective the State of Louisiana dropped its mandatory retail warning sign requirement for establishments that serve raw oysters that have undergone the treatment. The State of California enacted a similar exemption. Thompson says the southern oyster is now shipped all over the U.S., and has doubled or tripled shipment since the beginning of business. “The oyster stays nice and juicy, tastes salty and stays safe, as it doesn’t open (thanks to a banding process) until you want it to.” The absence of northern oysters has made the southern product more popular, as disease (not vibrio) has hit the Blue Point trade, although the northern oyster is coming back. Deli meats and sausages, long worrisome potential sources of contamination, have given rise to a number of antibacterials. Deli meats and sausages, long worrisome potential sources of contamination, have given rise to a number of antibacterials. One of the latest is called Mirenat-N, a solution of lauric arginate, a novel antimicrobial compound derivative of lauric acid, larginine and ethanol, all naturally occurring substances. The molecule was first synthesized by the CSIC (Higher Council of Scientific Research) in Barcelona in 1984, then patented and commercialized by the Vedeqsa Lamirsa Group. Its U.S. distributor is A&B Ingredients (www.abingredients.com), Fairfield, N.J.
Its most notable features are a broad spectrum of antimicrobial efficacy; high partition coefficient (meaning the product concentrates in the water phase of products, where most bacterial action occurs); activity over a wide pH range (3 to 7); and safety — LAE is hydrolyzed in the human body and it has GRAS status. A much lower amount of Mirenat-N is needed, compared to conventional anti-microbials, so it has little effect on the taste and texture of the original product, company officials say. It is effective in controlling a wide range of micro-organisms including Salmonella, Listeria monocytogenes, E. coli, Lactobacillus, Staphylococcus aureus, Candida albicans and numerous other pathogens, bacteria, molds and yeast.